The Holidays are upon us already! How did that happen so fast? I love this time of year… all the yummy desserts, family traditions & warm cozy nights snuggled up by the fire. This year we’re having Christmas morning at my house where we’ll have everyone over to eat a huge breakfast & open gifts. Later will be dinner at my mom’s with Clayton’s family & mine. She’s making her famous garlic mash, honey ham & other goodies. I cannot wait!! I’m looking forward to being preggers this holiday season. 1. 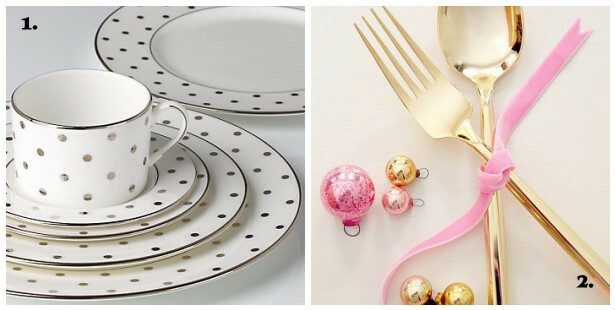 I recently saw these Kate Spade inspired dishes on Pinterest and thought they would be fantastic for the holidays. You could easily create this DIY on some plain white dishes you have laying around or go grab some at your local Goodwill or thrift store! Pair them with another patterned plate & you have a layered look with lots of personality. 2. I love anything gold. Tie silverware with ribbon, lace or twine to give your place settings a pulled together look. 3. Use Dollar Store fake fruit and spray paint them with metallic and glitter. Place one on at each place setting for some added glam. If you are planning on having assigned seating, you could attach a name tag to each pear. 4. 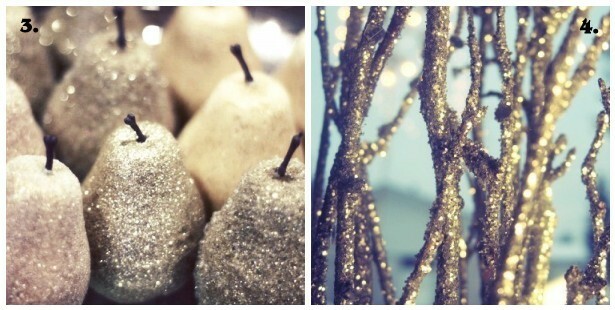 To keep the sparkle theme going, use more glitter spray paint on branches from your backyard! Add them to a vase or lay them in the middle of the table mixed with a ton of candles and you’ve got a gorgeous centerpiece that cost almost nothing! 5. 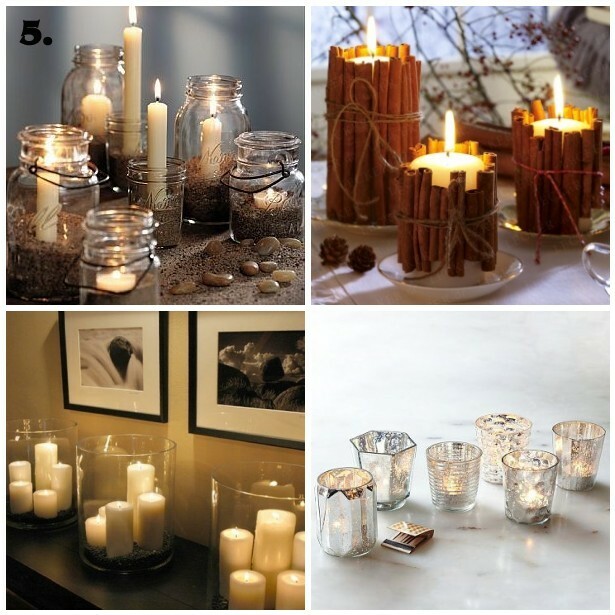 There are so many creative things you can do with candles. If you have mason jars, you can fill them with sand, cranberries, rice or whatever you like. While you’re at the Dollar Store grab a bunch of pillar candles to add to hurricane vases for a romantic lighting all throughout your house. Tie cinnamon sticks around candles with twine. So cute & it makes your house smell amazing! Mercury glass is timeless and goes great with any holiday decor. 6. 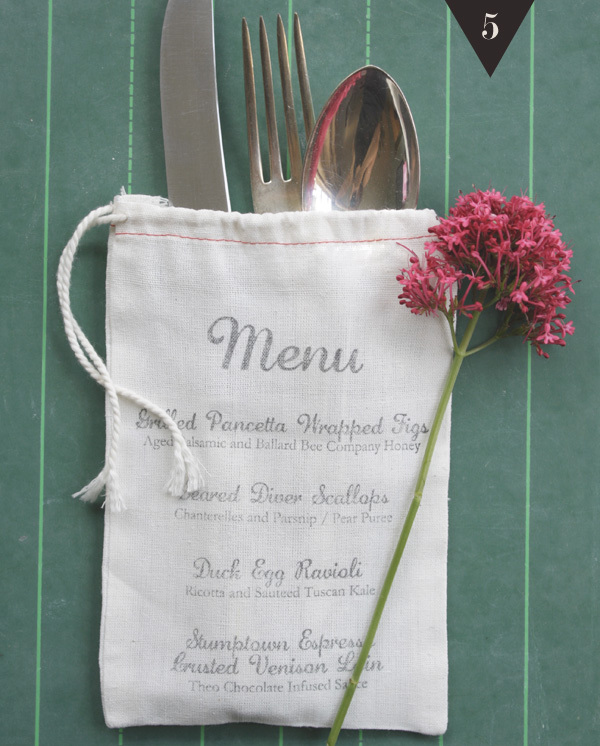 Personalize a menu for each place setting or use a pretty chalkboard and display the menu there. Either way menus are a nice touch. I found this DIY menu using muslin bags and a custom stamp! How cute is this?? Which is your favorite? What sort of things to you like to do to save money on holiday decor?